A September 2009 visit by Angelina Jolie and Brad Pitt to the GHC assisted St. Peter’s Drug-resistant TB ward in Addis Ababa. 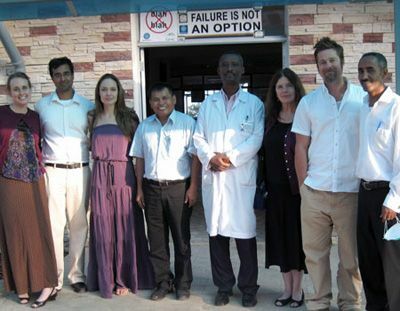 From left to right, Rebekah Prasad, RN, Dr. Tosh Prasad, Angelina Jolie, Dr. Sok Thim, Nurse Mohammed, Anne Goldfeld, Brad Pitt, Dr. Ridwan Bushra. When Global Health Committee team members first visited Ethiopia, they were appalled to find men and women with drug-resistant tuberculosis (drug-resistant TB) who had no access to proper care or the life-saving antibiotics that are readily available in more developed countries. Rebekah Prasad and Dr. Sok Thim examine a patient at Mother Teresa’s shelter. Rounds on patients on the St. Peter’s drug-resistant TB ward. The patients met the requirements to receive free drugs from the WHO, but the medicines, promised a year earlier, were held up in a tangle of bureaucracy. Immediately, the GHC stepped in to fill the gap. With the generous support of the Jolie-Pitt and Annenberg Foundations, GHC bought some of the needed medicines, and arranged for the pharmaceutical company Eli Lilly to donate the rest. But that was just the beginning. To deliver the critical care as quickly as possible, the GHC formed a unique partnership between Ethiopian doctors and the medical workers of the Cambodian Health Committee (now, GHC-Cambodia), pairing them in a direct “south-to-south” transfer of expertise and best practices from one resource-poor nation to another. GHC-Cambodia executive director Dr. Sok Thim traveled to Ethiopia to conduct an intensive on the ground training course for physicians and nurses involved in drug-resistant TB care and follow up, Ethiopian doctors traveled to Cambodia at the end of December 2008, where they received colleague-to-colleague training in the diagnosis and management of drug-resistant TB. There, they were coached in the community Community Treatment Model (C-Community Treatment Model) methodology successfully pioneered and implemented countrywide by GHC-Cambodia. When the African workers returned home, Cambodian colleagues went, too, and worked with the Ethiopian Ministry of Health to establish a drug-resistant TB detection and treatment program based at St. Peter’s Hospital in the capital city, Addis Ababa. Just two months later, in February of 2009, the Ethiopian Ministry of Health began its first-ever treatment program for drug-resistant TB, starting ten patients on life-saving antibiotics. Since then, that number has increased increasing steadily, but is still only a fraction of the estimated 6000 Ethiopians with drug-resistant TB. The GHC will continue to do whatever it takes to obtain the necessary medicines and provide access to care for all. As Thim says, “We achieved universal access to the medicines needed to cure drug-resistant TB in Cambodia, and there is no reason we cannot succeed in Ethiopia." The spread of drug-resistant TB coincides with the HIV epidemic worldwide, and so the GHC approach includes improving care for adults and children with HIV/AIDS. This year, the GHC aims to replicate another of its Cambodian success stories in Addis Ababa, where planning is underway for the Zahara Children’s Center. The Zahara Center, funded by actor activists Angelina Jolie and Brad Pitt, will be modeled after the Maddox Chivan Children’s Center in Phnom Penh, and will offer children infected or affected with HIV/ AIDS a full spectrum of medical, psychological, educational and social services. Ethiopia is the oldest independent nation in the world, and one of the poorest. Emerging from decades of war, the country with the second largest population in Africa has a per capita GDP of less than $1000. Along with its neighbors in sub-Saharan Africa, Ethiopia has been battered by the twin epidemics of HIV and TB. Ethiopia ranks seventh among the world's 22 countries with a high tuberculosis (TB) burden, but the situation is likely worse, since only about a third of new TB cases are detected. Ominously, strains of drug-resistant TB are emerging in Africa. Dr. Sok Thim and pharmacist Ephriam in the GHC pharmacy. Patient on drug-resistant TB ward. Evaluating a patient for admission to the St. Peter’s drug-resistant TB ward at Mother Teresa’s hospice in Addis Ababa. A growing problem worldwide, drug-resistant TB (drug-resistant TB- TB) springs up when antibiotic treatment for conventional TB is interrupted, the medicines are of poor quality or are not used correctly. Once it arises, drug-resistant TB can spread from person to person. In Ethiopia, resistance to individual first-line anti-TB medicines is increasing, as is drug-resistant TB, defined as resistance to the two most powerful first-line drugs, isonized and rifampicin. In addition to drug-resistant TB, there has been an increase in southern Africa of potent TB strains that are virtually untreatable with existing drugs. Extensively Drug Resistant TB (XDR-TB) is resistant to isoniazid and rifampicin, and to at least two other classes of second-line drugs. In a country where one in fifty adults, or almost 2 million people, are infected with HIV, the spread of drug-resistant TB could be an unbearable catastrophe. Yet, in Ethiopia, the costs of the lab tests necessary to determine drug resistance are beyond the reach of most people; second-line antibiotics are simply unavailable. According to a 2009 WHO report on Tuberculosis in Ethiopia, there were an estimated 3086 new cases of drug-resistant TB in 2007, yet only 145 were confirmed by lab tests; zero were treated. Current estimates put the number of new drug-resistant TB cases at least 6,000 per year. Rounds at St. Peter’s drug-resistant TB ward. Angelina Jolie visiting the drug-resistant TB ward in September 2009. The GHC is working to change this by building up local health care infrastructure and providing medicines to bring drug-resistant TB treatment to people who need it. To do this, GHC staff from the Cambodian Health Committee is partnering with Ethiopian doctors to adapt the methods pioneered over the last decade in Cambodia for use in Ethiopia. Working with the Ethiopian Ministry of Health and Dr. Ridwan Bushra, the head of the Ethiopian drug-resistant TB program, the GHC has begun treating patients at St. Peters Hospital in Addis Ababa. As of October 2009, there are 36 patients receiving second-line antibiotics purchased with funds donated by the Jolie-Pitt Foundation. In addition, pharmaceutical maker Eli Lilly and Company, Indianapolis, Indiana, donated 45 courses of the second line antibiotic, capreomycin and Jacobus Pharmaceuticals donated their signature drug PASER for two patients. Going forward, the Chao Center for Industrial Pharmacy & Contract Manufacturing at Purdue University in Lafayette, Indiana will provide the GHC with 1,800 vials of cycloserine, which will provide this essential drug for 45 patients. The Ethiopian Ministry of Health also hopes to receive medicines for an additional 45 patients promised by the Green Light Committee of the World Health Organization. In Ethiopia, one-third of adults with TB are also infected with HIV. Rather than see two diseases, the GHC sees one patient, and is working to improve treatment for HIV/AIDS in coordination with TB care at the hospital. The GHC’s activities this year in Ethiopia represent just the start of building the clinical capacity to deal with the emergency that drug-resistant TB presents in the country. In the coming years, the GHC will do whatever it takes to provide training, facilities and medicines to establish a clinical and research network similar to the one now in place in Cambodia. That is the only way forward, to learn from the terrible natural experiment of drug-resistant TB to answer fundamental questions about the disease, and allow for the discovery and testing of future cures. Planning is underway for the first of its kind children’s center in Ethiopia, aimed at helping children infected or affected by HIV. The new center will be modeled after the Maddox Chivan Children’s Center in Phnom Penh, a project of GHC-Cambodia. At the center, the children and their families find medical care, psychological counseling and support, education and vocational support, delicious and nutritious food, and more. In addition to the outstanding health care they receive, children play games and sports, make art, do crafts projects, celebrate holidays and learn about their culture. Adolescents receive counseling, participate in peer groups, and learn life skills. The Maddox, opened in 2006, now serves over 700 children infected or affected by HIV, who look to the center as a place free of discrimination, where they can simply enjoy being among friends. . The Zahara center is being made possible by a gift from actors and activists Angelina Jolie and Brad Pitt, and will be named after their Ethiopian daughter. Graft Architects, a leading German design firm, is drawing up plans for the center. There are currently an estimated 89,000 children living with AIDS in Ethiopia, and thousands more orphaned or traumatized by the impact of HIV in their families. The new center will provide children with the care and support they need to regain their health and to achieve happy, productive lives.